New Delhi: The President of India Shri Pranab Mukherjee conferred the Florence Nightingale Awards to 35 nurses from across the country on the occasion of International Nurses Day at the Rashrapati Bhavan, in the presence of Shri J P Nadda, Minister for Health and Family Welfare. The President congratulated the award winners and said that nurses in India are at the forefront of national healthcare system and their contribution is central to its success. The President added that in a developing economy such as ours, nurses and midwives are crucial in delivering cost-effective and, at the same time, good quality healthcare and our nation is proud of their services. The President further said that the need to adapt our standards to the evolving demands of healthcare and update our capacities is self-evident. “Our country needs to respond swiftly to healthcare challenges that keep coming up. I am glad to see that the National Health Policy, 2017 envisages a new momentum in innovation and nursing,” the President elaborated. 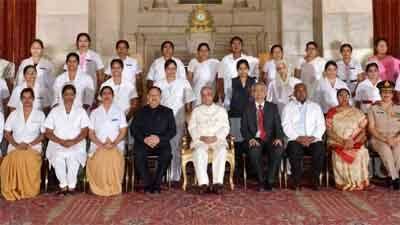 Laying emphasis on continued capacity building the President said that as Indian nurses take on greater local, national and international roles, there is a need to ensure appropriate professional development and human resource policies in the country – and increased involvement of nurses in policy development. “The complexity of medical and healthcare practices today demands that nurses are fully involved in the planning, implementation, research and evaluation that goes into the successful delivery of patient care. These functions come with responsibilities and accountability. The legal and policy framework of nursing protocols and standards of practice must facilitate optimal utilization of competencies,” the President said. Speaking at function, the Health Minister stated the Government is determined for making improvements in nursing and midwifery education and services in a comprehensive way that encompasses health promotion, disease prevention, treatment and rehabilitation and attainment of global mandates of SDGs and Universal Healthcare. Shri J P Nadda also informed that the Ministry has undertaken number of initiatives for strengthening the nursing cadre. Some of them are setting up of 128 ANM & 137 GNM schools. The Health Minister further stated that in order to increase the availability of graduate Nurses in the country, 17 Schools of Nursing have also been provided funds for upgradation into Colleges of Nursing. “Roll out of Nurse Practitioner course for Critical Care and has been launched to meet the challenges and demands of tertiary health care services in India. The course will be commencing from the academic session 2017-18. 75 Colleges have applied for the conduction of the course for 2017-18. 15 Colleges have been inspected & permitted inspection & inspection for remaining Colleges is being carried out. Nurses Registration and Tracking System (NRTS) was rolled out in June last year, Shri Nadda added. The Florence Nightingale awards are given to the outstanding nursing personnel employed in Central, State/UTs. Nurses working in Government, Voluntary Organizations, Mission institutions and the private institutions can apply with the due recommendation of concerned State Government. The Florence Nightingale Awards carries Rs.50,000/- cash, a certificate, a citation certificate and a Medal. I think there is very poor show on this front from the State of Jharkhand. Central Govt must look into this and grill officers of Jharkhand Health Deptt. without further delay. There are lot many negligent nurses in the medical profession, not a single has been held responsible or penalized by any consumer court . This includes Physiotherapists also . Physiotherapy is part of the nursing only . They all should be held accountable by the law . These award winning nurses have forgotten the dress code for nurses. All of them should have recited the award in common uniform for nurses or civil dress without ambiguity. All them want to look like doctors i e is a SHAME.